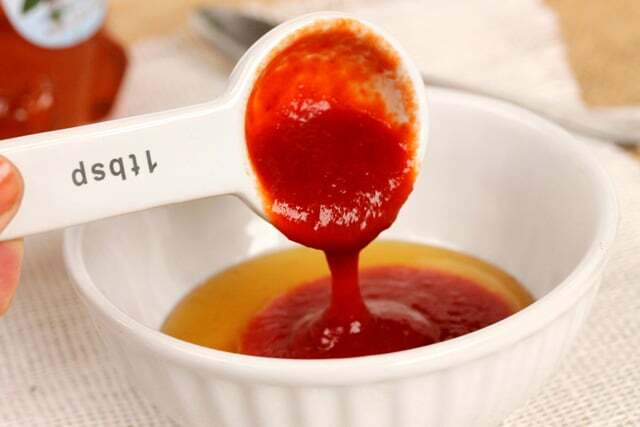 No matter how you look at it, spicy and sweet flavors taste so good together in sauces and marinades. It’s so easy and tastes really good. And the good thing about this spicy and sweet sauce is, if the sauce is too spicy just add more honey until the taste is to your liking. 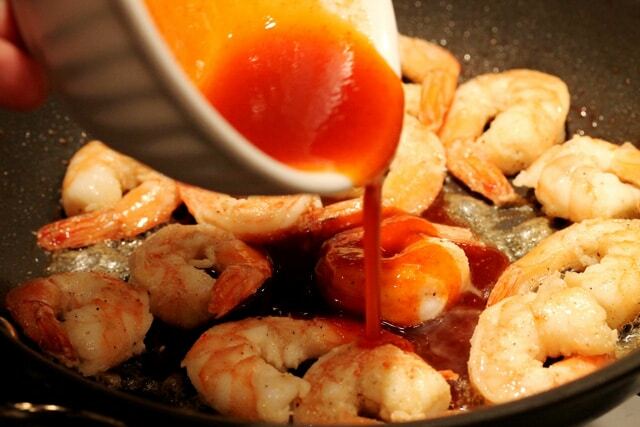 In this recipe, shrimp is lightly sautéed in butter along with the spicy and sweet sauce. 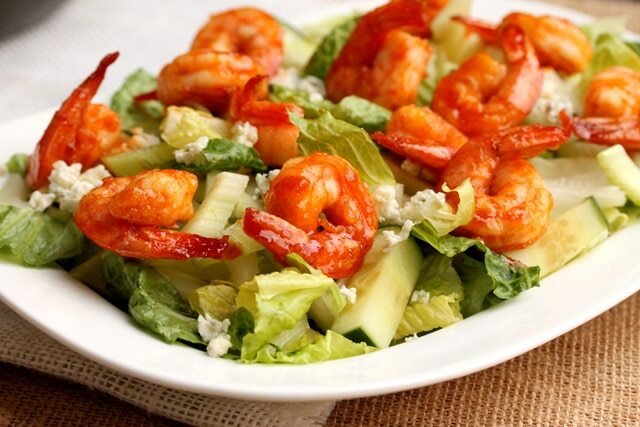 And wella, that’s really it for the shrimp. 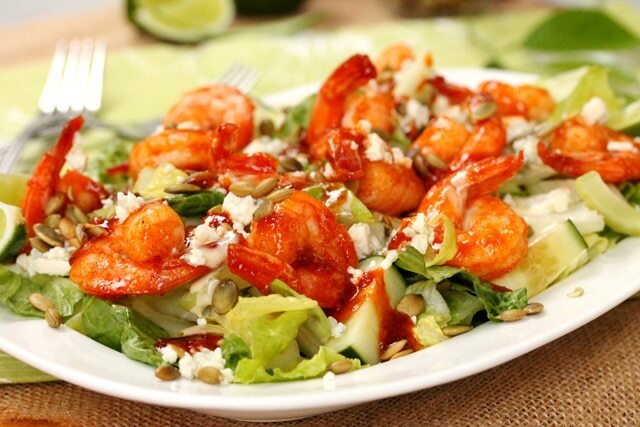 All you have to do is top a salad with this flavorful shrimp and you have a wonderful meal. 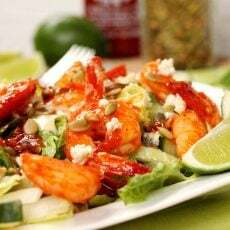 And it may be a good idea to make some extra shrimp so that the chef gets to try it out first, for taste test purposes of course. 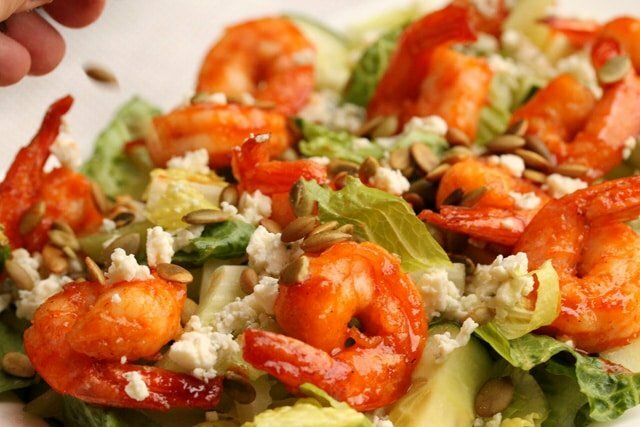 This salad can be served as an appetizer, side dish salad, or a light main dish salad. If serving this as a main dish, garlic bread would taste really good with it. Here’s a super simple recipe I love and have been making for years “Easy Homemade Garlic Bread“. 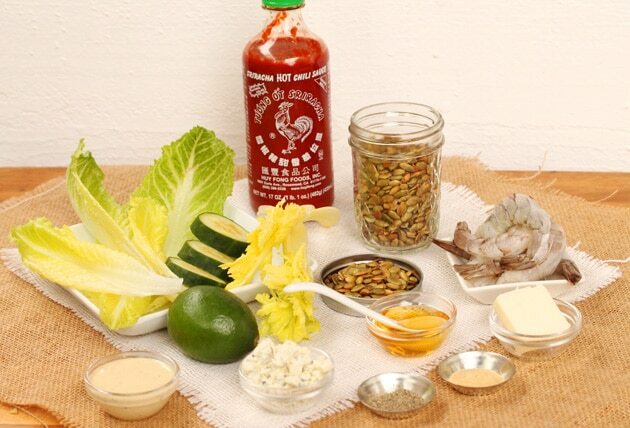 Mix and do a taste test to see if it’s too spicy for your liking. 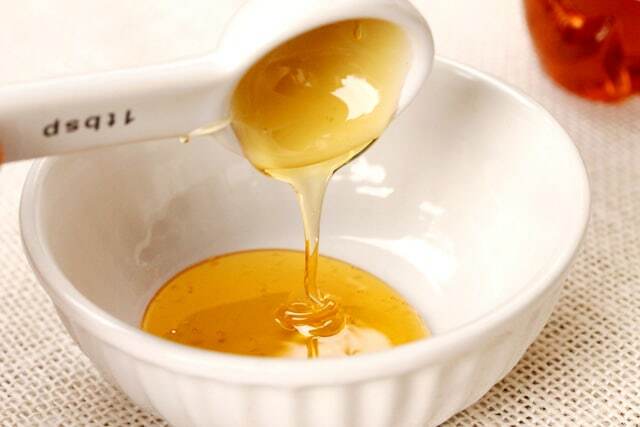 If so, add more honey. Heat a medium size skillet on medium heat and add butter. …and then add the spicy and sweet sauce. 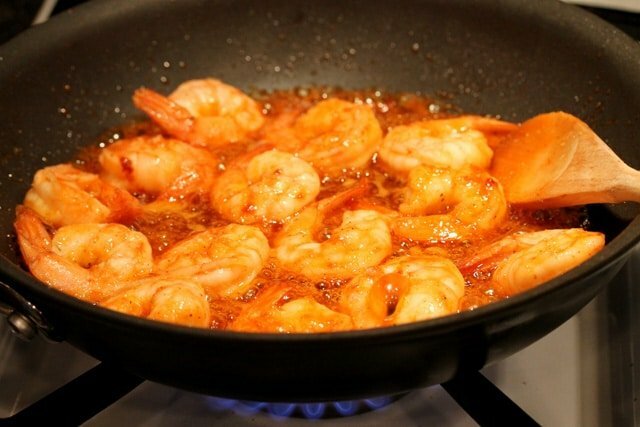 Stir and cook for another 2 minutes or until the shrimp is cooked. Remove the skillet from the heat and set aside for a moment. 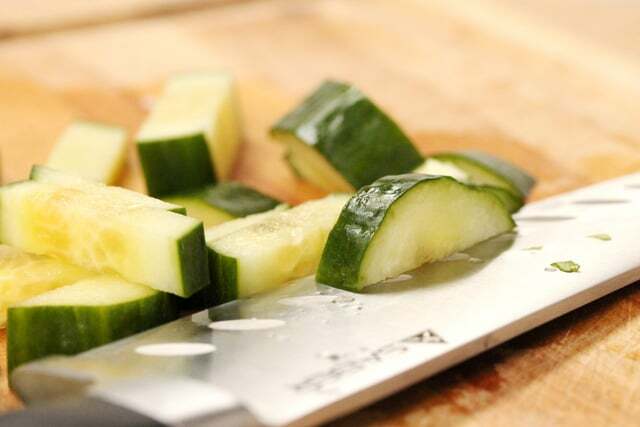 cut the cucumber in fairly thick pieces (about 1/2 an inch thick). 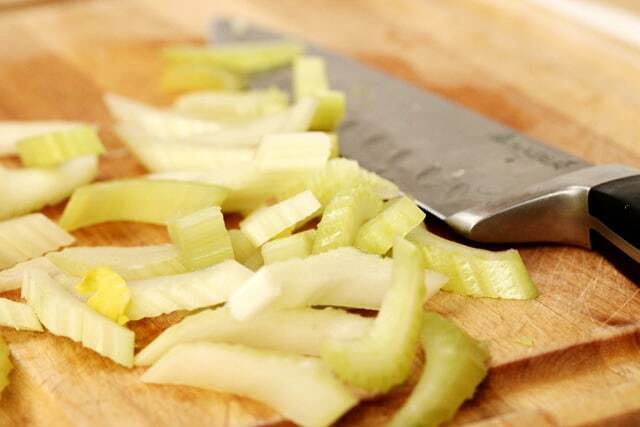 Chop the celery in fairly large pieces. 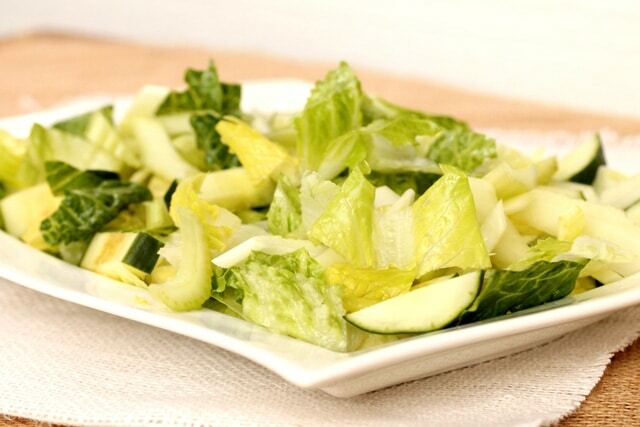 To a large serving platter or single serving dishes, add a layer of the lettuce. Add the cucumber and celery. Next, top with about half of the crumbled blue cheese. 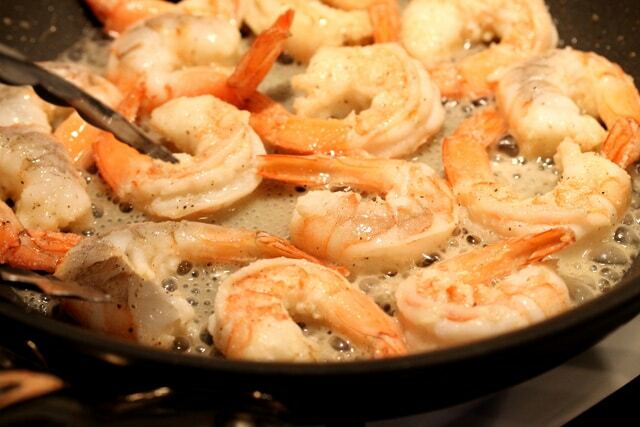 add the shrimp (reserve the sauce that’s left in the pan and set the pan aside for a moment). 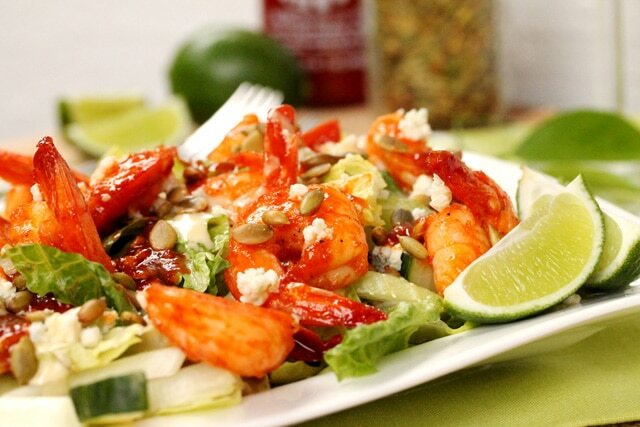 Squeeze fresh lime juice on the salad. 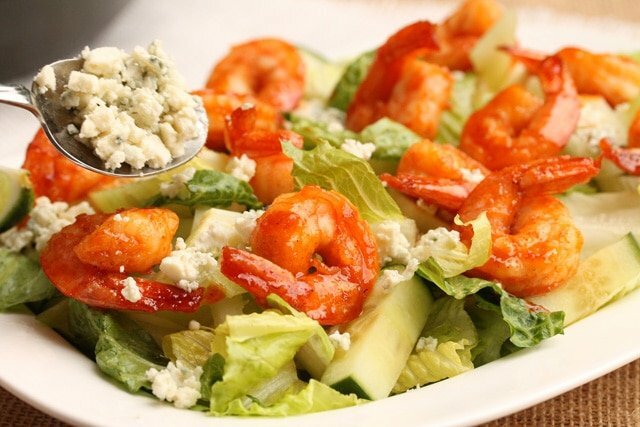 Add the remaining crumbled blue cheese on top of the shrimp. 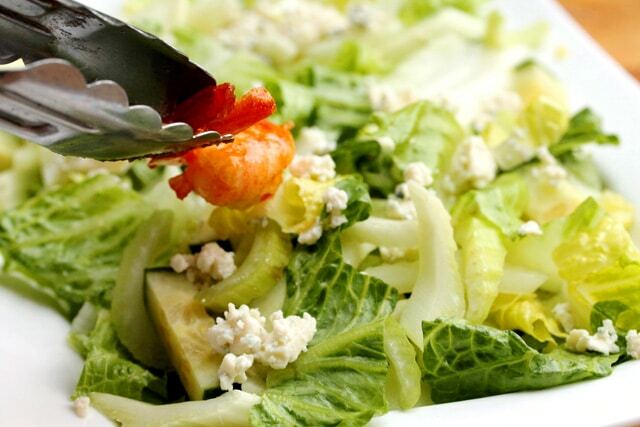 and drizzles of Caesar or blue cheese dressing. Then dig in and enjoy! Goes great with garlic bread or rolls and butter. In a small bowl add honey and Sriracha sauce. 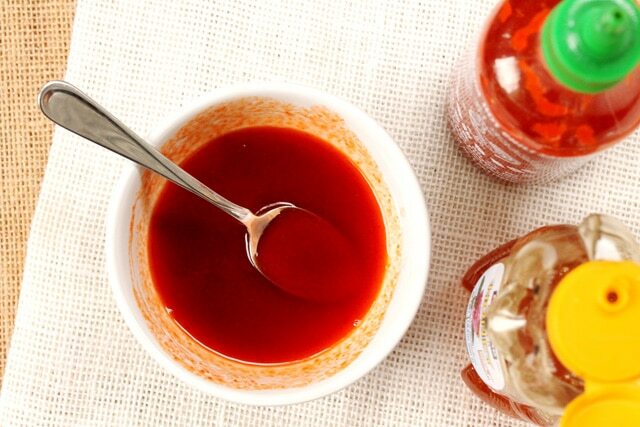 Mix together and do a taste test; if it's too spicy for your liking, add more honey. 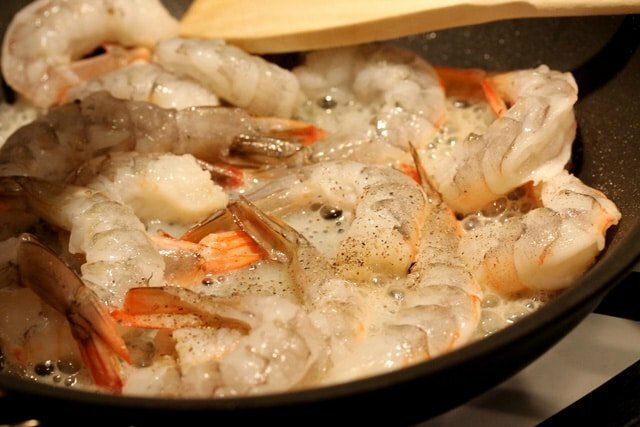 When the butter starts to melt, add the shrimp, granulated garlic, ground black pepper, and the spicy and sweet sauce. 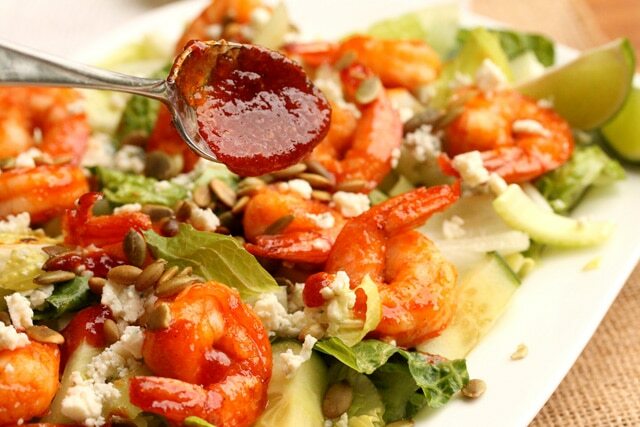 Stir in the spices with the shrimp. 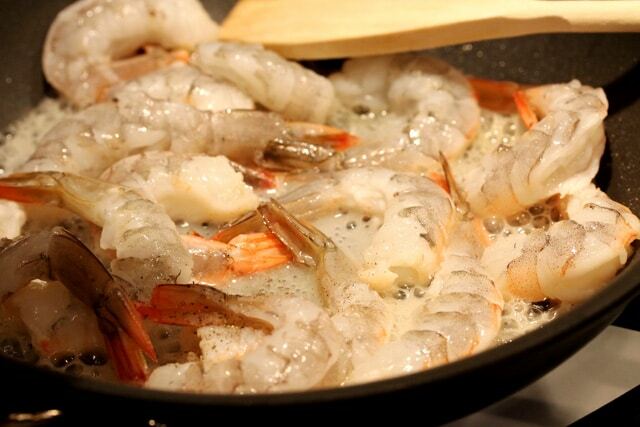 Cook for another 2 more minutes or until the shrimp are done. 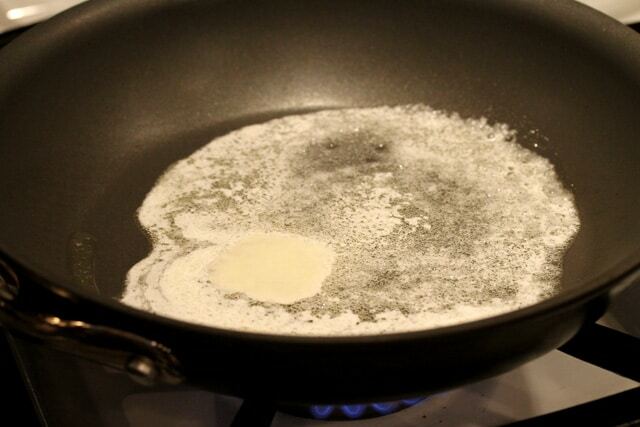 Remove the skillet from the heat and set aside for a moment. 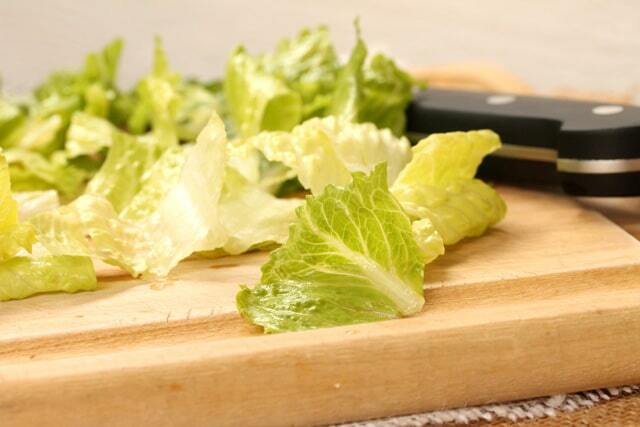 To a large serving platter or single serving plates, add a layer of the lettuce. 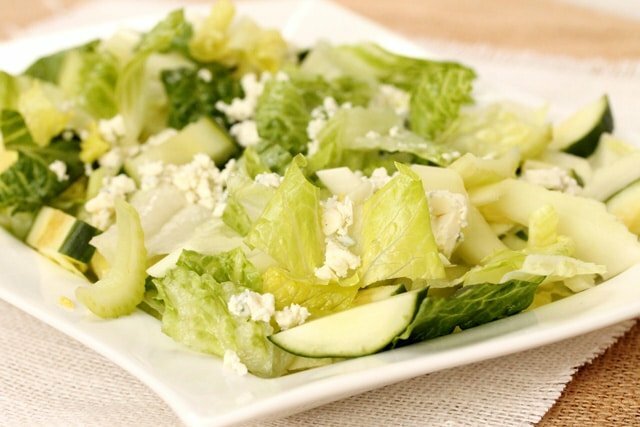 Top with cucumber and celery. 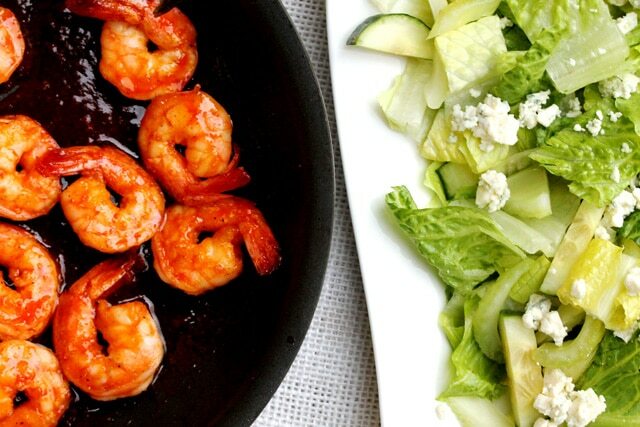 Next, top with half of the crumbled blue cheese, and the shrimp (reserve the sauce that’s left in the shrimp pan). 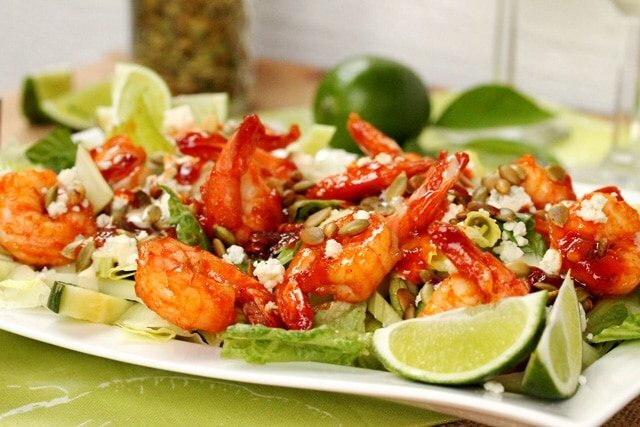 Squeeze the juice of 1/2 of a lime on the salad. 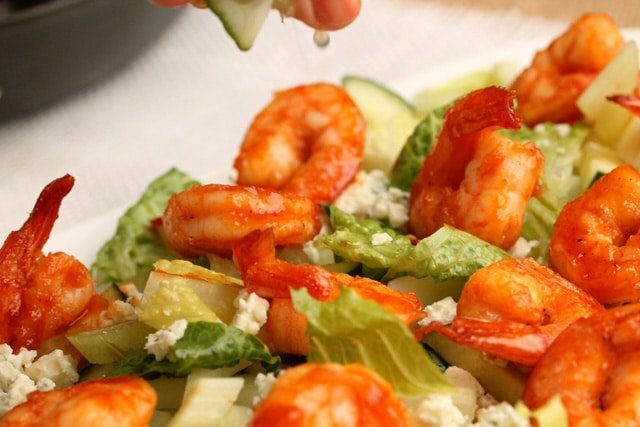 Add the remaining crumbled blue cheese on top of the shrimp. Top with pepita seeds and the remaining spicy and sweet sauce from the pan. 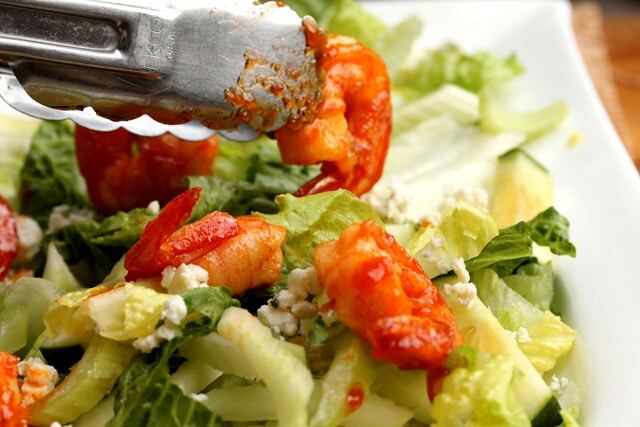 Serve right away with drizzles of Caesar or blue cheese dressing on top. Serve with garlic bread or rolls and butter. 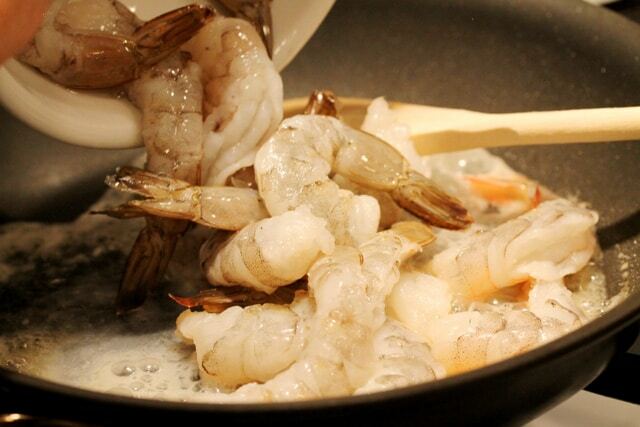 Just FYI, you’re cooking your shrimp too long. They should turn out “C” shaped, not “O” shaped. 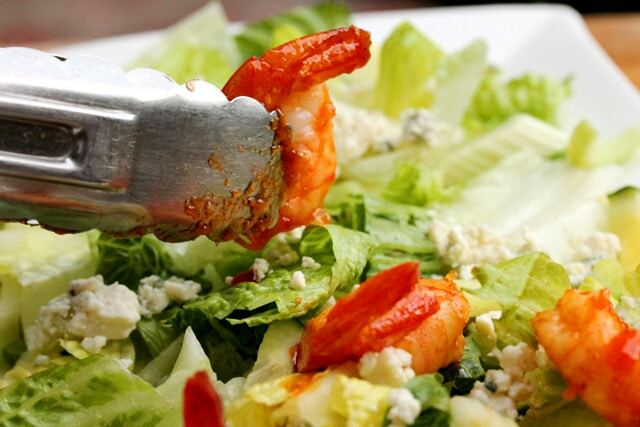 Overlooking leads to tough shrimpies. Hi There, thank you so much for letting me know. Looking forward to the next time I make shrimp and cooking them a bit less. Have a great week! Hi There, thank you for letting me know about this site. I’ll be sure to come by and check it out. Have a nice weekend! Hi There, thank you very much for letting me know. I’m looking forward to visiting your site. Have a great rest of the week! This is so gorgeous and summery! 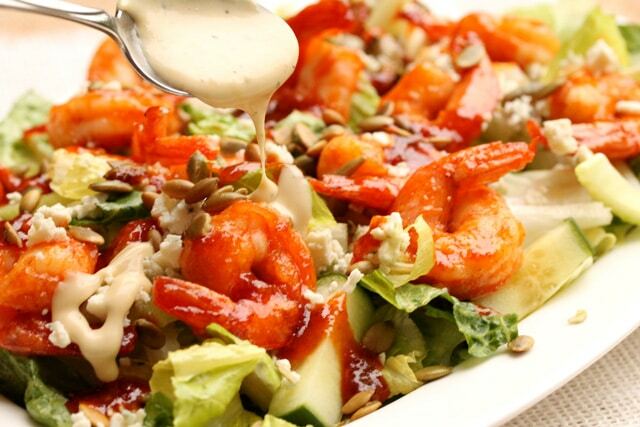 I love all the flavors in this salad, thanks for sharing! Hi Georgia, and thank you very much for stopping by. Have a wonderful weekend!